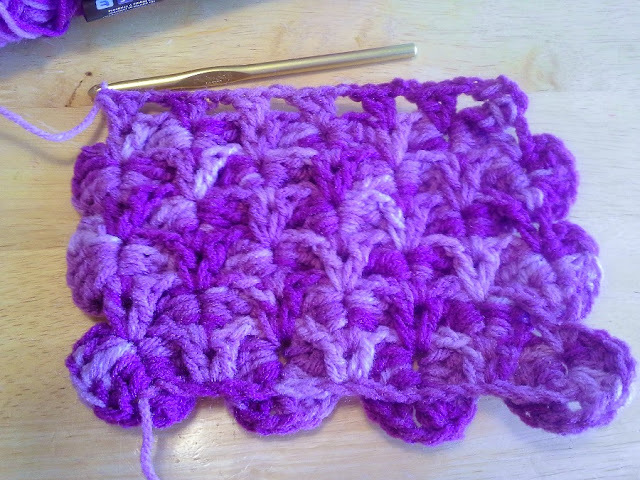 I have been teaching myself a new crochet stitch over the last few days. It's call the "crocodile" stitch and it's all the rage this year for yarn addicts across the land. I thought I would try my hand at it after finally seeing a good tutorial on it by Mike Sellick over on youtube. 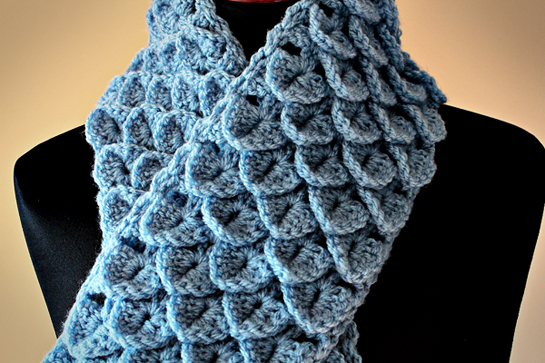 The pattern resulting from the variegated scales would make a lovely scarf or handbag. This is probably not considered a basic stitch, more of an intermediate one, or for someone who has already done some crochet. 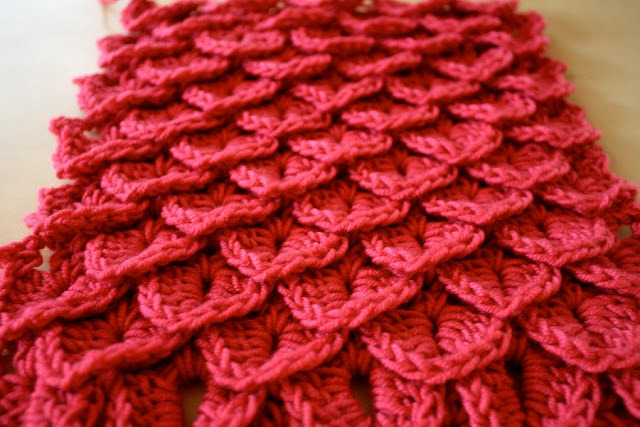 It does however use only the the three main basic stitches, such as chain, slip stitch, double crochet. If you are inspired to learn crochet from these pictures I highly recommend going to youtube and looking up Teresa at Crochet Geek. 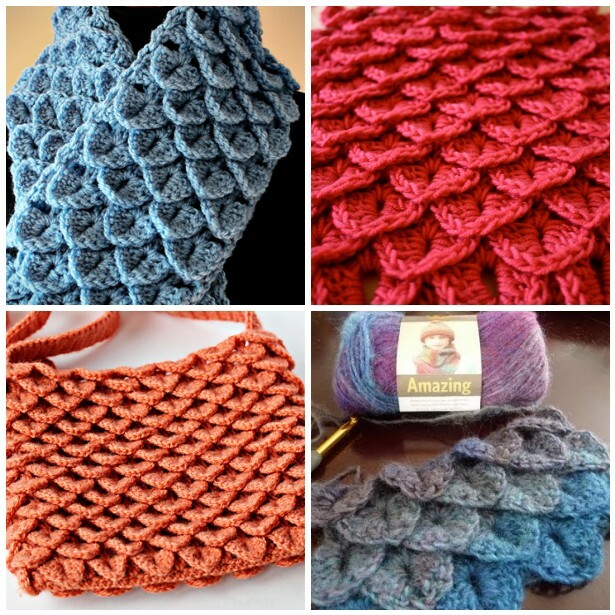 She has beginning courses of all the basic stitches, and many many projects up to intermediate and advanced with tutorials, patterns and walkthroughs. I learned all my crochet basics from her. 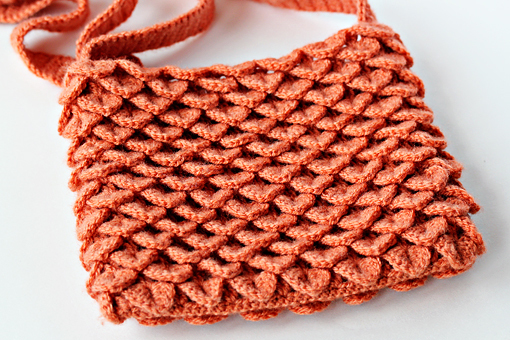 In the meantime, if you have a little crochet technique already under your belt and wanted to try this crocodile stitch, I recommend watching Mikeysmail on you tube. The first row of any project is usually somewhat frompy and wonky. Yes I'm pretty sure those are real words. The first row tends to twist and is hard to hold onto. Once you get past the first row, things start falling into place. Then, following the tutorial, I press on. 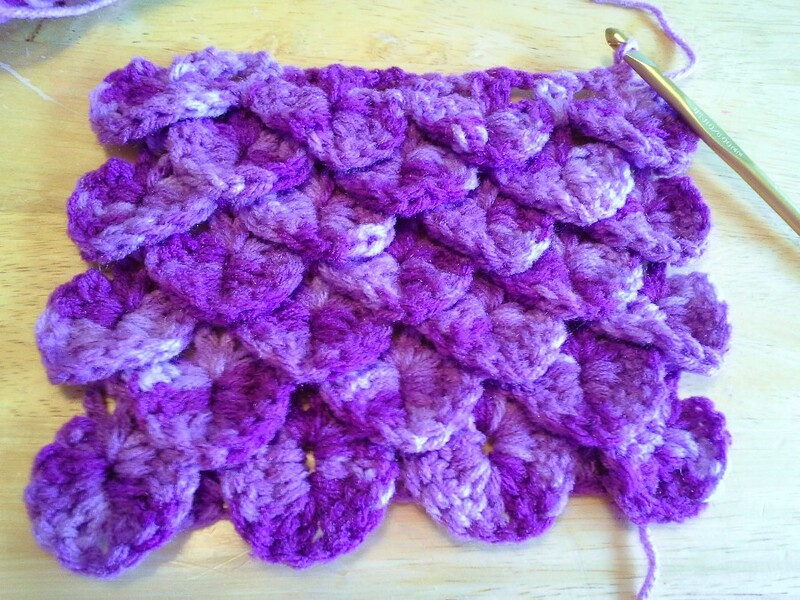 The second row helps shore up the "scales" and now it's starting to look like something. The pattern goes one row of 4 scales, then a row of three. This way, you will have an even edge going up the sides. I decide to try a few more rows. Hey, I think I'm getting the hang of this! The hardest part of this stitch is the second half of the scale. 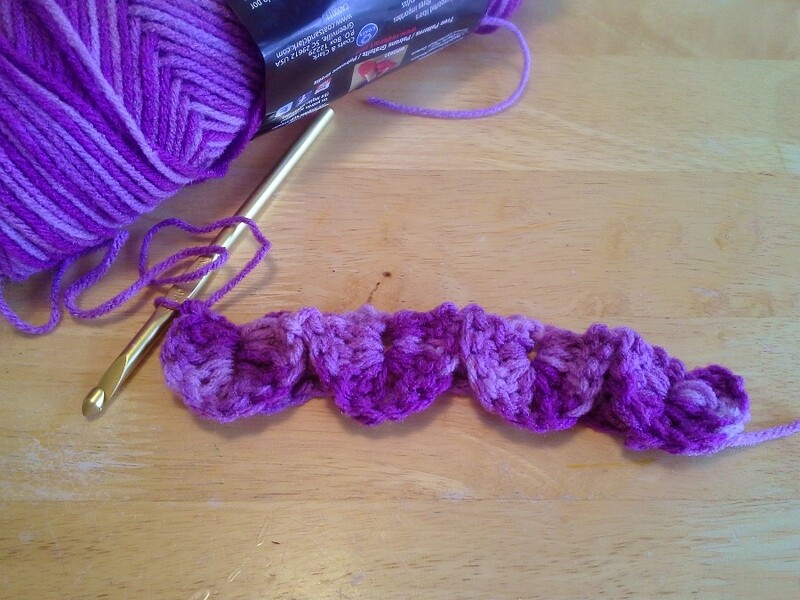 The first side of the scale is from the right side, but the other side of the scale you have to hold the project oddly and almost do five double crochets "backward" or back up the other side of the scale. It doesn't feel right or look right until you get to the top, then you lay the scale flat, and all of the sudden it looks great. The back of the project sort of resembles a "ladder" for the scales to climb up on. 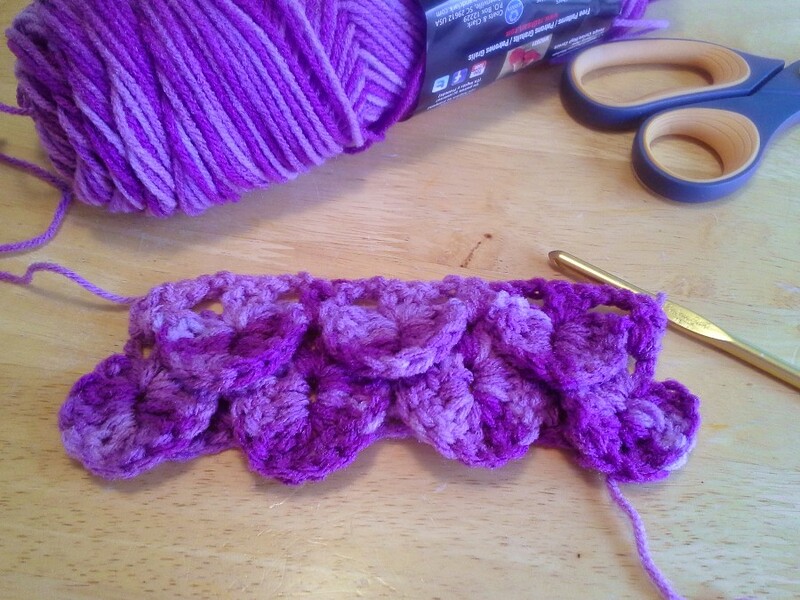 I want to find a longer variegated yarn that doesn't change colors so fast, like Mikey had in his tutorial. 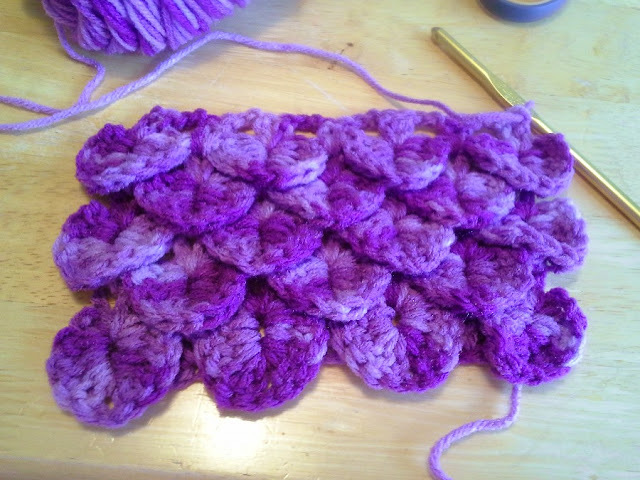 After another row I stop to admire my crocodile pattern. Hey this is getting fun! Long live the crocodile. Once you master this stitch there are some darn cute things you can make with it. I am most inspired by zoom yummy, look how cute this hand bag is! Petra over at ZoomYummy rocks. How cute is this?! She has Etsy shop where you can purchase this pattern so you can make it for yourself! Another cute thing she made was this scarf. I love the color! I like that solid yarn colors look just as great as variegated ones. 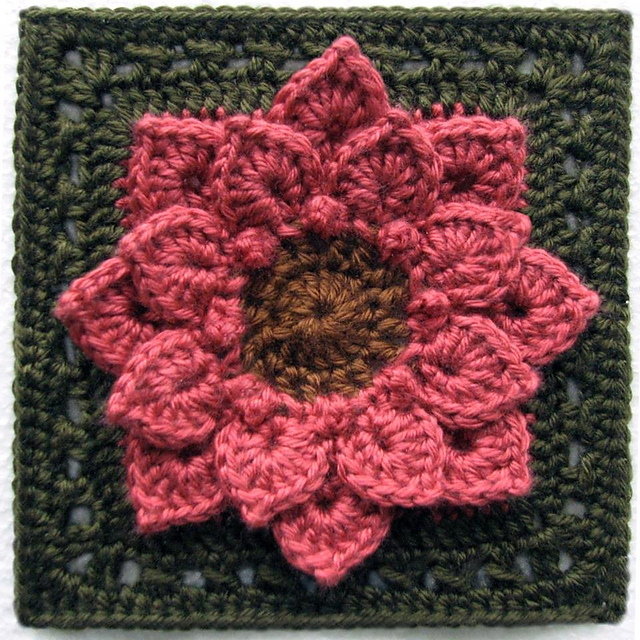 It seems to be a versatile stitch as well, as I've seen it used in costumes, gloves, and even helps to add some awesome dimension to granny squares in the form of flower pedals. Cute! Looks really easy- isn't it?